Interview: Dan Gilroy On 'Velvet Buzzsaw,' Both Art-World Satire And Slasher Writer and director Dan Gilroy brings back Jake Gyllenhaal and Rene Russo for his newest feature, a horror-comedy set in the modern art world. Also, the male lead is named Morf. As in Dan Gilroy's previous film, Jake Gyllenhaal stars in the comedy-horror hybrid Velvet Buzzsaw. 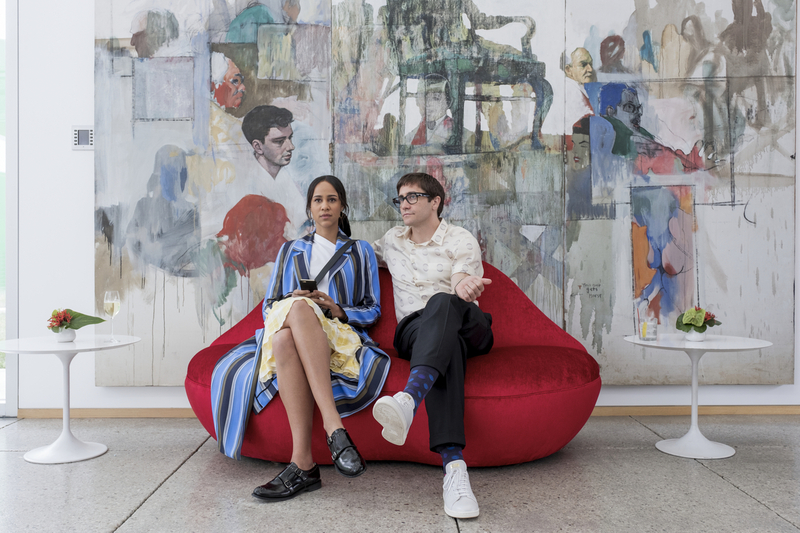 Gyllenhaal plays an art critic named Morf, while Zawe Ashton plays gallery assistant Josephina. "We're campy, we're kitschy, we're satire," Gilroy says in an interview. "The film is, I believe, is meant to be fun. You know, I think there's some very serious themes and ideas in this. But at the same time, I think that humor can be a very powerful avenue to transmit an idea. So I love that we're in that realm." I went through a personal experience: I worked on the epic debacle Superman Lives. And I worked on it for a year and a half, and they finally pulled the plug on it two weeks before shooting. And I went down to Santa Monica, and I was sitting at the beach. For a year and a half, I've worked on this script. And I was watching the waves, and I thought: I could have written the words on the beach and have the water wash them away. And it was a real sobering thought. And shortly thereafter, I said to myself: It doesn't matter. As a creator, it was a valuable experience. I got something out of it. I've grown as a writer. When I got up from the beach, I sort of decided that I was going to do things for myself as much as other people. And I think it's important to always know that art of any sort is more than a commodity. Yes, hopefully, everybody's art can generate enough money to pay their rent, and take care of their needs, and if it gets bigger than that, more power to you. But if it doesn't, never lose sight of the fact that you're investing something into it that has meaning. Really, if there's any sort of central theme to the film, it's that art is more than a commodity. Artists invest a part of their soul in their work, and it has value on that level. When I was trying to decide whether to go with [Netflix] or not, I went online. And ... there was a story about somebody who said, "Oh, Netflix is going to destroy the theatrical experience." And there were 50 comments that followed, and they were all like, "Oh, you must live in Los Angeles or New York, because I don't get to see all these movies that you're getting to see." And I suddenly realized: Netflix has democratized the filmgoing experience. And as a storyteller, I just want people to see the film. Yes, I would love everybody to see the film in an IMAX theater with pristine sound. That's just not going to happen. So the idea of two or four or one person sitting and watching this film in the comfort of their home — that's fine with me. First of all, I like unusual names 'cause I'm an enormous Charles Dickens fan, and I love the character names that he would come up with for his characters. And so: Morf Vandewalt sort of came after a lot of thought. Rhodora — the rhodora is a flower ... and I think it was Emerson who wrote a poem about the rhodora. Vetril Dease ... I did a movie that never got made, set in the South in the 1800s, and I got a list of census rolls, and one of the names on the census from, like, 1842 was Vetril Dease. And I used that from that. About six months before we started shooting, my art advisor who came on [for] the movie, David Hundley, and I started to create – it's over 100 pieces of original art. They fell into two categories: There is this central deceased artist named Vetril Dease — we needed to create a body of work for him — and then we needed to create all the art that surrounds, you know, Art Basel and the galleries. And we hired artists to create original pieces of art. It was quite an undertaking. That was a big part of the film. Jim Bissell, our production designer, was deeply involved in this as well. It's all right now sitting in a storage facility that I'm not sure what I should do with. Some of it's creepy, some of it's not my taste. There's a 2-ton, 6-foot, solid chrome sphere that's just sitting there that I don't know what to do with. I'm very uncertain what to do with it all, to be honest. I've had no reaction from the fine art community whatsoever. I'm very curious to see what they think of it. When I made Nightcrawler, I actually thought that local television news would be offended by what we had done. And I would run into people all the time afterwards saying, "Oh, no it's so accurate" and "We don't do that. Other people do that. So I'm not really offended." So I'm hoping that the contemporary art world looks at it that way. I should say, last week I finally caught up with a really wonderful documentary called The Price of Everything on HBO, which is about the contemporary art world. And here are the titans of the industry speaking about the very issues that our film is about. So I'm hoping that they see it as something that's relevant and real. Nathan Heffel edited this interview for broadcast. Patrick Jarenwattananon adapted it for the Web.